A couple of weeks after the inauguration of the new city hall*, local authorities announced that Mayor PARK Won-soon would move in March 2013 from his residence in Hyehwa-dong (which had to be abandoned because of the renovation of Seoul fortress**) to a controversial place in Bukchon: a hanok built during the Japanese occupation by relatives of an infamous collaborator. Even if it later belonged to BAEK In-je, the founder of Baek Hospital, some people contested the Mayor's decision. Today, Korea JoongAng Daily publishes an interesting focus on this two-story hanok, its past and future ("An old, unusual hanok gets a new life"), where we also learn that PARK will eventually move in later than scheduled, next September. Personally, I have no objection to that move, provided the whole story is properly taught. I'm glad Seoul's top officer will welcome hosts in Jongno-gu's second largest hanok, a rare display of Korean traditional architecture. And after all, wasn't the old City Hall itself - now a library - built by the Japanese? 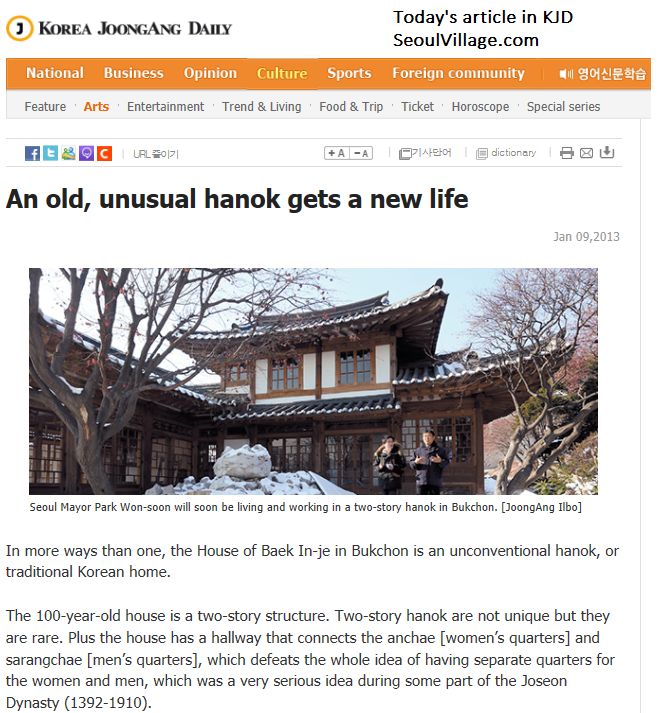 Furthermore, if you take any luxury hanok built for a Korean VIP during that period and particularly in this neighborhood, chances are the owner was palling around with the occupants anyway. 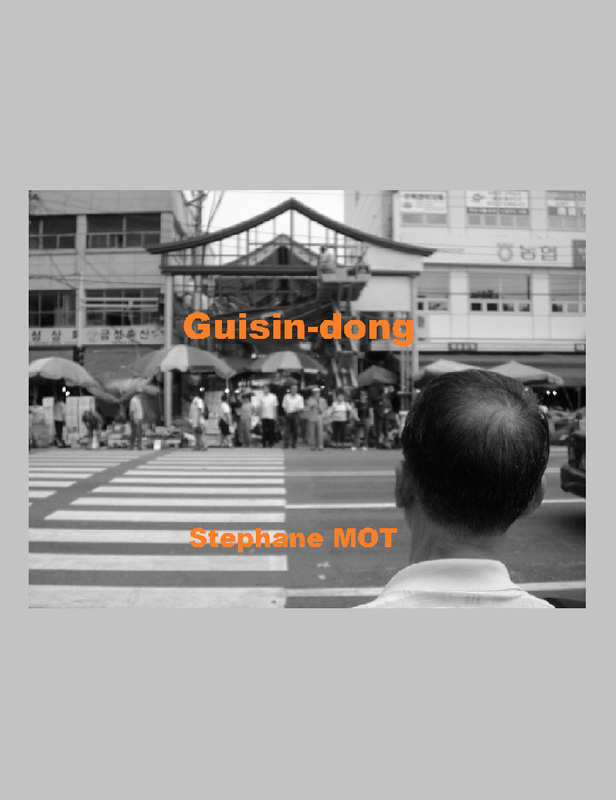 I keep that in mind each time I pass by Bukchon's most touristic hotspot. Following a "gentlemen's agreement", the Japanese occupants would generally live south of Cheonggyecheon, except of course for the government, or the land claimed over Gyeonghuigung in Shinmunro area. And unsurprisingly, "literary" Seochon was a bit more rebel than Bukchon, an enclave of power between Changdeokgung and Gyeongbokgung***. I recently mentioned a similar controversy about the name of a palace changed under Japanese rule ("Deoksugung or Gyeongungung? "), and I think the best way to prepare the future is to be as transparent as possible about the past, and to reveal both sides of the coin. If you should boycott all places with a troubled past, most world capitals would be empty. Some day, spotlights will focus on what happened after the occupation, which ill-gotten assets finished in which hands under which conditions. I'm not sure everybody's ready for that level of transparency. * see previous posts about this landmark, and "Seoul Tsunami City Hall, The Other Korean Wave"
**** see "Seochon's Dead Poets Society (YI Sang, YUN Dong-gu)"